5pm Ages 12 months through 6 years old. 7pm Ages 7 through 20 years old. 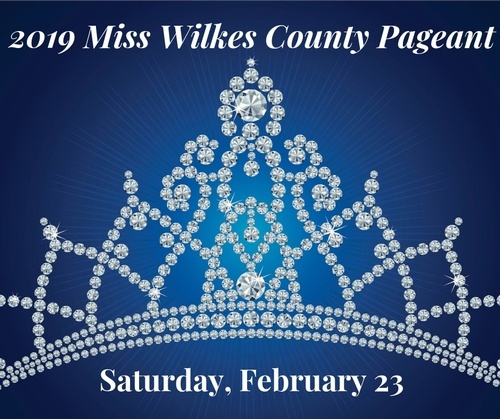 All contestants must be residents of Wilkes County. If you come to the 5:00 Pageant your hand stamp will get you back in to the 7:00 Pageant at no charge - but you must show your hand stamp. Ages 12 months-6 years: 5:00 pm (Please check in at 4:00 so that you can receive your line-up number.) Crowning after a brief intermission. The newly crowned Queens and King are invited to return to the 7:00 Pageant to be introduced on-stage. Ages 7 years-20 years: 7:00 pm (Please check in at 6:00 so that you can receive your line-up number.) Crowning after a brief intermission. It would be best if you come fully dressed and ready to compete, but there will be restrooms if you should need to change.